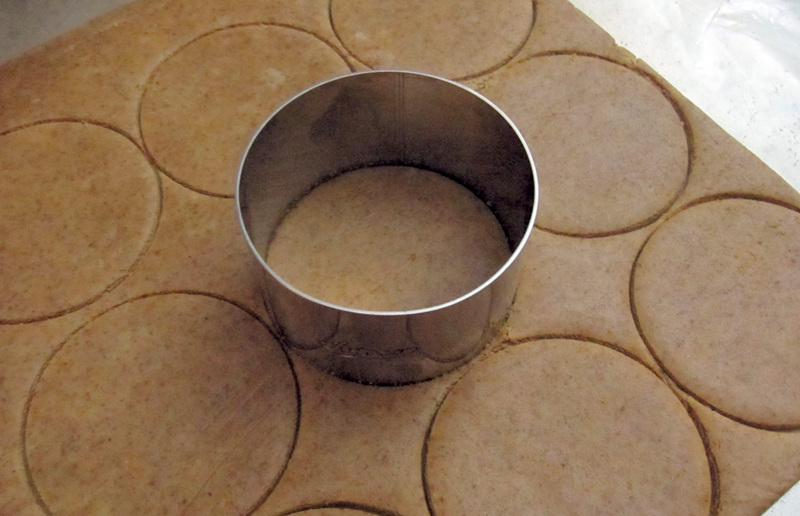 Using the ring mold as a cookie cutter. Using the ring mold to stack the mousse on top of the cookie. 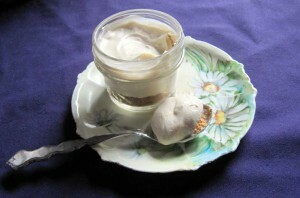 I modified the original lemon curd recipe so that the mousse would have enough structure to stand up. If your mousse doesn’t stand up nicely on the cookie base, you have two options. You could par-freeze it before serving. This would require as many rings molds and servings since you could only unfold them at the last minute. The cookies might spread slightly in the oven. I didn’t find that this affected the presentation enough to worry about it. If you want to be a perfectionist, bake the cookies in the ring mold for the first 5 minutes then remove to the remainder of the baking time. For a more casual dessert, I would just go with the tart in a jar and present a more casual dessert. I used my 4 ounce canning jar. Bonus: they freeze well so you can make them way in advance! If you make the whole batch of butter cookies and lemon curd, you’ll have leftovers. Treat yourself to Lemon Ice Cream Sandwiches as well! Stir the gelatin into the lemon juice and lemon zest. Set aside. Beat the eggs and the agave nectar with a hand-held mixer on high speed until they’re light yellow and ribbon, or rest on top of the mixture for a second before disappearing when you lift the beaters. Stir the lemon mixture into the egg mixture, then put the top of the double boiler on the pot with the water boiling gently. The bowl should not touch the water. Beat on medium high speed until the mixture thickens and reaches 140° F. Take the lemon curd off the double boiler and beat in the butter ½ tablespoon at a time. Push through a fine mesh sieve into a clean bowl, place plastic wrap directly on the curd, and refrigerate until chilled. Place the cream off the top of a refrigerated can of coconut milk in a bowl and whip on high until creamy. Fold in one cup of chilled lemon curd. 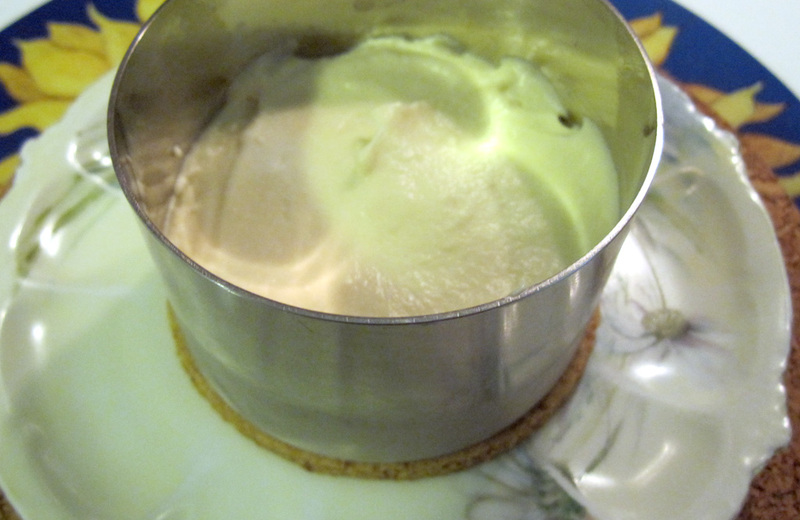 Ring mold method: Place a cookie in the bottom of the ring mold and scoop in lemon mousse mixture. Try to level the top of the mousse. Run an offset spatula around the ring mold to release it. Carefully remove the ring mold for a beautiful plated presentation and serve. Canning jar method: Take all the cookies that didn't survive intact from making the ring mold sized cookies and crumble them in a plastic bag with a rolling pin. Combine the crumbs with just enough coconut oil that they hold together. Take @2 tbsps of cookie crumb mixture and press it into the bottom of a 4 or 8 oz jar. Fill the rest of the jar with lemon mousse. The jars can be refrigerated for up to a week or even frozen. The lemon curd to coconut cream should be 1:1. However, I have found that the solid amount in the canned coconut milk varies from can to can. For best results, measure the solid amount from the coconut milk and use the same amount of lemon curd. Save the coconut liquid left over from the can of coconut milk for smoothies! I shared this recipe with Happiness is Homemade, Crafty Showcase, Inspiration Monday, Sunday Best, Monday Funday, Sweet & Savory, Flaunt It Friday, Showlicious, Mix It Up, A Round Tuit, Motivation Monday, Think Pink, Saturday Sparks, Clever Chicks, Sew Darn Crafty, Show Stopper, Savoring Saturdays, Dare to Share, Recipe of the Week, Simple Saturdays, Simple Life, See Ya In Gumbo, Real Food Recipe, Inspiration Spotlight, Anything Goes, Fabulous Friday, Friday Favorites, Friday Frenzy, Foodtastic Friday, Frugal Friday, Fancy This, Old-fashioned Friday, Fight Back Friday, Welcome to the Weekend, Natural Family, Unprocessed Fridays, Weekend No Rules, Five Friday Finds, Friday Foodie, Gluten Free Friday, Let’s Get Real, Feathered Nest, Pennywise Platter, Link Party, No Rules Weekend, Homeacre Hop, Inspire Us Thursday, Tutorial Thursday, Simple Lives, Doggone Dirty Craftin’, Thank Your Body, Favorite Things, Full Plate Thursday, Plant Based Potluck, Fabulously Frugal, Wildly Original, GF DIY Tuesday, Try A New Recipe, It’s a Party, Wellness Wednesday, The Yuck Stops Here, Made by Me, Pretty Wednesday, What’s Cookin’, Mountain Woman Rendezvous, Wicked Awesome, Motivation Monday, Real Food Wednesday, Tasty Tuesday -2, Show Me What Ya Got, Allergy Free Wednesday, Waste Not Want Not, Creative Muster, Wonderful Wednesday, Southern Special, Healthy Tuesday, Delicious Dish, One Project at a Time, Sweet & Savory Sunday, Mouthwatering Monday, Hearth & Soul, Tutorial Tuesday, Natural Living Monday, In & Out of the Kitchen, Mad Skills, Tuesday’s Table, Naturally Sweet, Handmade Tuesdays, Recipe Sharing Monday, What’d You Do This Weekend, Share Your Stuff, Show Me What You Got, Homemade Mondays, Homestead Barn Hop, Inspire Me Monday, Fat Tuesday and Mostly Homemade. 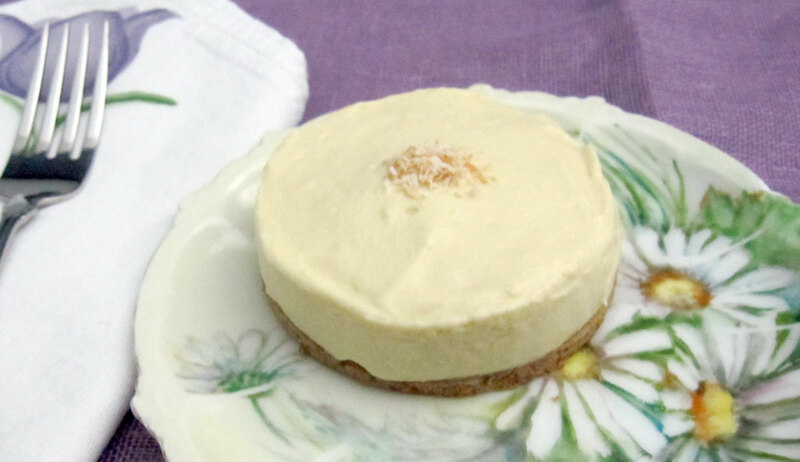 This entry was posted in Desserts, Recipes and tagged coconut, coconut oil, cookies, corn free, egg, gluten free, lemon, refined sugar free. Bookmark the permalink. I love this recipe! Can you pin this to your pinterest board? I’m not very teck savvy and would love to pin this post! thanks! Done! Thanks for reminding me. I’m new to Pinterest and I forgot. This looks so delicious! 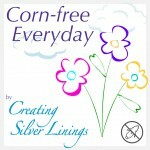 I’m stopping by from the Yuck stops here blog hop. I am not a fan of lemony cakes but I bet yours is just wonderful and refreshing! I love lemon and this tart sounds lovely. Thanks for linking up to Sweet and Savoury Sunday, stop by and link up again. Have a great day!! This looks perfect for Summer!! Thank you so much for linking up at Tasty Tuesday! Your recipe has been pinned to the Tasty Tuesday Pinterest board! Please join us again this week! What a wonderful Lemon Tart! Thanks so much for sharing this awesome recipe with Full Plate Thursday and come back soon! Yum! I love all things lemon. This looks beautiful too. 🙂 Thanks for sharing at Simple Lives Thursday. YUM. I loooove lemon desserts. Thanks for linking up to #realfoodrecipes! Like the tip about making these in a jar and freezing for an easy make ahead option. When I entertain, I get nervous about too many last minute things and having to do things in front of people. But I can give them a jar and spoon!